1. Preheat oven to 350 F. Line 2-3 baking sheets with parchment paper. Sift the flour, baking powder, and salt into a small bowl. Set aside. 2. With en electric mixer, mix the butter and the sugars. Add the flour mixture and beat with the mixer on low speed. 3. Stir in the chocolate chips and half of the hazelnuts, using a wooden spoon. 4. Drop teaspoonfuls of the mixture onto the prepared baking sheets, to form 1/4 inch mounds. Space the cookies 1-2 inches apart. 5. Flatten each cookie lightly with a wet fork. 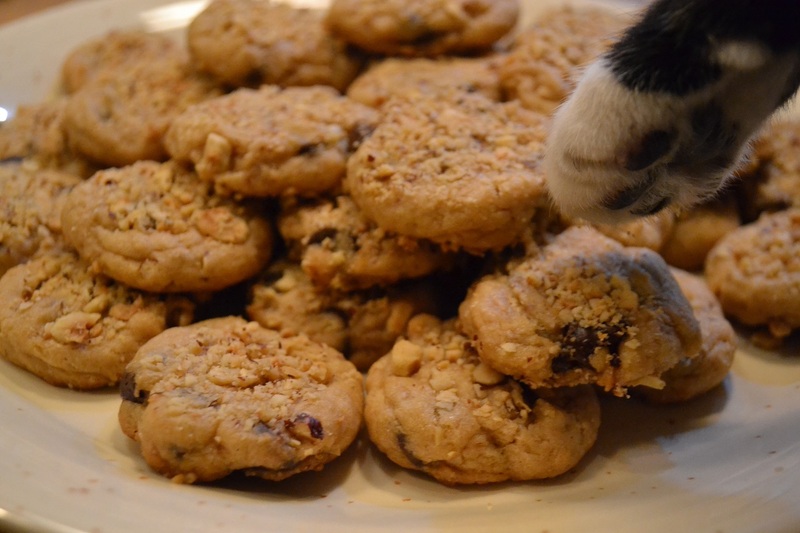 Sprinkle the remaining hazelnuts on top of the cookies and press lightly into the surface. 6. Bake for 10-12 minutes until golden. Transfer the biscuits to a wire rack and leave to cool. * Hazelnuts are rich in monounsaturated fats (the GOOD fats). They also contain vitamins B and E, magnesium, mangenese, zinc, iron, and selenium. Categories: Cookies & Treats, In The Kitchen | Tags: chocolate chip, cookies, hazelnut, tastes like Nutella | Permalink.